The current edition of Wine Blogging Wednesday, hosted by the oh-so-clever Chez Pim, carries the 'wacky wine name' theme. There is a wide and tempting range of wacky wine name possibilities, but it didn't take me long to settle on this wine from Bonny Doon vineyards. Literally translated, "Le Cigare Volant" is French for The Flying Cigar. Or euphemistically speaking, The Flying Saucer. Pretty wacky either way you cut it. The story behind this name is even wackier. Bonny Doon's irreverent owner, Randall Graham, was an original California Rhone Ranger. One of those pioneer winemakers to bring the wines of France's Rhone Valley stateside. 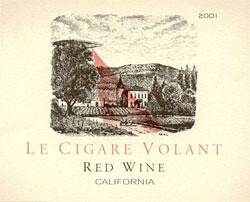 Le Cigare Volant's maiden voyage was in 1984. This particular wine is Graham's tribute to Rhone Valley's Chateauneuf-du-Pape. A blend of grenache, syrah, mourvedre, viognier, cinsault and carignane. The name of the wine is his overseas potshot at those CdP winemakers, who in 1954, with very serious and grave intentions, had an ordinance passed to prevent Flying Cigars/Saucers from flying over or landing near their vineyards. Furthermore, the penalty for infringing upon this ordinance requires that any Flying Cigars/Saucers be impounded! Makes sense to me. You? Le Cigare Volant's label does a particularly nice job of illustrating a Flying Cigar/Saucer abducting a CdP winemaker and his bullock cart. So we've established the wacky wine name, wacky vineyard owner and a wacky story behind it all. Was the wine whacked too? Le Cigare Volant had an opaque garnet color. After about 30 minutes of decanting, I was drawn to the aromatic nose, close-encounters-of-the-third-kind style. Copious amounts of cherry, raspberry and red licorice were highlighted by klingon-like cloaked black pepper notes. This wine is full bodied with ripe plums leading the way for plenty of dark-side fruit. Spice follows as if commanded by jedi knights. Smooth tannins provide an E.T. like backbone. Touches of acidity use gravitational pull to keep everything balanced. A light years long finish full of spice, fruit and tannins.